Even though we have not yet officially reached the first day of Spring, I think the fact that it is finally sunny outside and it is now still light when I leave work is sufficient for me to say that as far as I'm concerned Spring has practically sprung! To celebrate this occasion and to make a change from Winter soups, I thought that this week's instalment in the simple recipes for healthy eating series would be an only slightly premature Spring Vegetable & Herb Risotto. 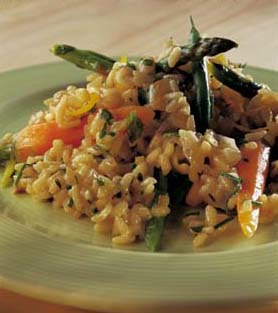 This is a great recipe which combines tasty seasonal vegetables with deliciously filling creamy risotto rice. What's more, in the coming weeks seasonal vegetables such as asparagus and French beans will be on special offer at supermarkets and looking their best on market stalls, so what better time to start including them in your healthy recipe repertoire?! 1. Bring the vegetable stock to the boil in a large saucepan and add the asparagus, baby carrots, peas and beans. Bring the stock back to the boil and remove the vegetables at once using a slotted spoon. Rinse under cold running water. Drain again and reserve. Keep the stock hot. 2. Heat the oil in a large deep frying pan and add the onion. Cook over a medium heat for 4–5 minutes until starting to brown. Add the garlic and thyme and cook for a further few seconds. Add the rice and stir well for a minute until the rice is hot and coated in oil. 3. Add the white wine and stir constantly until the wine is almost completely absorbed by the rice. Begin adding the stock a ladleful at a time, stirring well and waiting until the last ladleful has been absorbed before stirring in the next. Add the vegetables after using about half of the stock. Continue until all the stock is used. This will take 20–25 minutes. The rice and vegetables should both be tender. 4. Remove the pan from the heat. Stir in the herbs, lemon zest and crème fraîche. Season to taste with salt and pepper and serve immediately on warmed plates. For more great healthy and low-fat recipes to help you on your way, check back next week for the eighth recipe instalment in my series of Top Simple Recipes for Healthy Eating and check out our great value, full colour, illustrated book here.